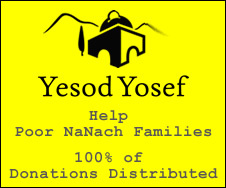 Boruch G. has donated another $400 for the spread of nanach. IN MEMORY OF BAS ZION BAT BENYAMIN, ISSAR BEN CHAIM AND DOVID HILLEL BEN AVRAHAM. MAY THEY REST IN GAN EDEN. HATZLUCHA TO YOU FOR SPREADING RABBENNUS FIRE. MAY WE SOON SEE HIM RETURN TO DESTROY THE EVIL THAT WONT REST.